Last week I took Baby Gray on what I thought was going to be a quick walk around the block before dinner. However, the walk ended up being over 30 minutes long (one block mind you) as he could not resist touching every plant and flower we passed...bless his little heart. 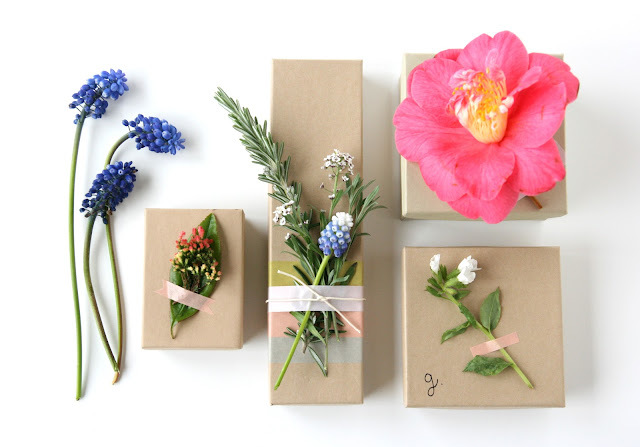 In doing so, I was amazed at how many varieties we came across in such a short distance; so many colors were represented and I made a mental note to revisit the evergreen gift toppers idea, but with a Springtime twist. As I photographed the little blooms, stems and herbs, I was further reminded that nature truly boasts the prettiest color palettes of all. Sometimes the most obvious beauty is the most overlooked, yes? It's amazing what you find when you look closer...I surprised myself when I found all these pretty plants either in my yard somewhere or in the alley behind my home. A couple of them might be weeds, but I don't care. They are pretty enough to me! 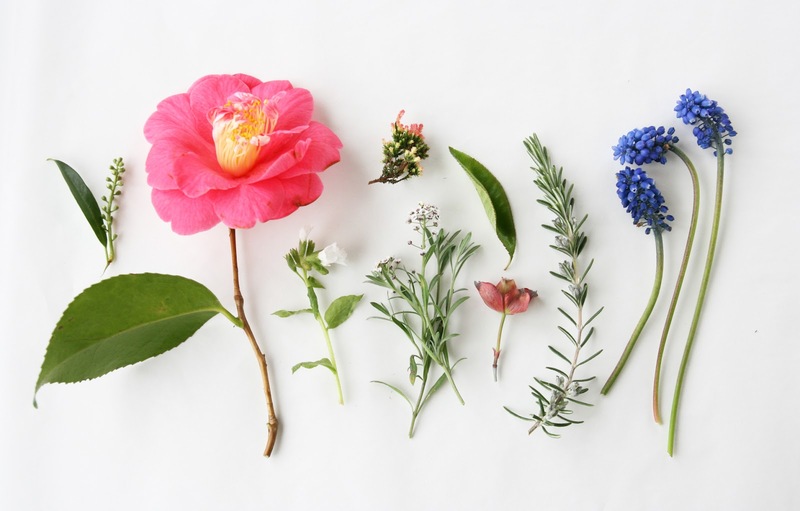 When choosing your blooms, try to gather a variety of colors, shapes, textures, etc. And don't just go for the obvious choices...throw some otherwise overlooked stems in there too for good measure. 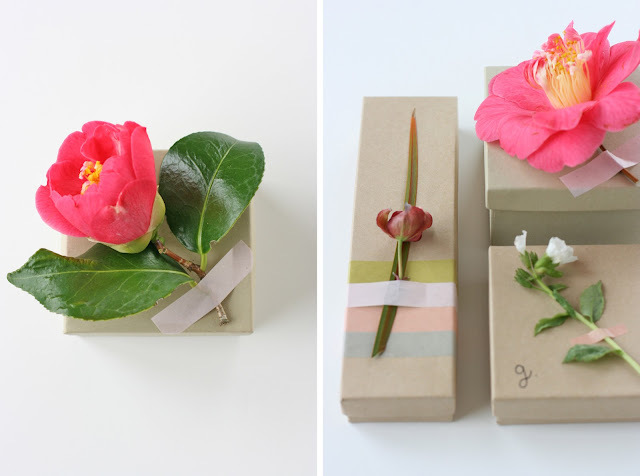 You may be surprised at the lovely combinations you come up with! Genius, gorgeous, and so simple! Just why I love your blog. Can't wait to find a reason to use this. Oooh, Mother's Day. Love it! My Henry brought a bloom to me the other day, when I asked him where he got it, he exclaimed "the yard!" Go figure! You never know what pretty blooms are out in the yard until you have a 3 year old to bring you a bouquet! loving the layers of inspiration here! holy moly. your images are gorgeous. simple beauty. thank you! These are absolutely beautiful! Perfect for Bridesmaid's gifts with the same flowers that match the wedding. Beautiful, as always, Stephanie! ... I love your photos. Oh goodness, thank you for the sweet comments. It means a lot! It was such a fun little project...I'm glad you enjoyed it! Excellent...I have lots of lavender growing int the yard...and a birthday present to wrap. This just highlights how simple can be so beautiful! Lovely idea, thanks for sharing. These are so lovely! What a sweet idea! Splendid! 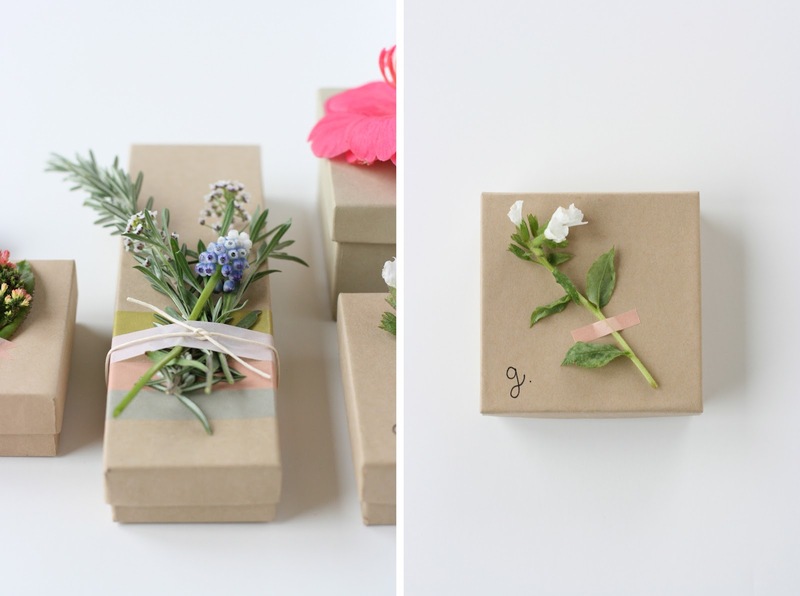 I write a blog about gift wrapping and this is such a fresh, lovely idea. Bookmarking to share with my readers for sure - thank you!